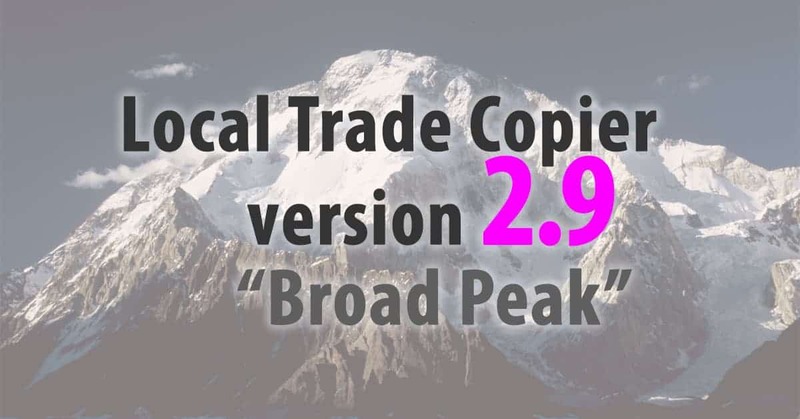 Local Trade Copier 2.9a "Broad Peak"
What’s new in LTC v2.9a? I’ve fixed one bug and added one new cool feature. Let’s take a closer look. With RiskMoney you can set the Client EA to calculate position size based on the fixed amount of money you want to risk. Instead of setting position size in percentage or having a fixed lot size, you can now set a certain amount of money (e.g. $500) to risk per position. Client EA will use RiskMoney value, available account equity/balance and the size of a stop loss value to calculate the position size (lot size) for all the trades it will copy from the master account. Important to mention that Stop Loss should be present in order for this to work (just like with RiskPercent parameter). XPairs was not working properly on some of the brokers, so I have fixed it. Now it should work fine with all brokers. XPairs allows you to set different Lot/SL/TP multipliers for a custom list of instruments. Usually it is used by traders who trade oils, commodities, metals, indices, etc. Make sure you get familiar with this parameter before you use it. It is explained in the instruction manual. Great work Rimantas! The only thing i’m missing as before since a long time, is a auto lotsize calculation for every trade based on a fixed relation to equity/balance without the need of a SL. So e.g. if i have $1.000 balance i want automatic calculation so all copied trades get a size of e.g. 0.1 lot, with account balance of $2.000 => 0.2 lot, with $2.500 => 0.25 lot, $3.000 => 0.3 lot, … Hopefully you will think about and build in something in a future version, that would make LTC perfect ;-)! Hi Max. Thanks for your feedback. You should try LotMoneyRatio. I think it’s what you need. See manual for details. Hi Rimantas, great, thank you very much for you answer, that is exactly what i was looking for, shame on me ;-)!